Bush’s act of kindness comes nearly 60 years after he and his wife, Barbara Bush, lost their 4-year-old daughter Robin to leukemia. George H.W. 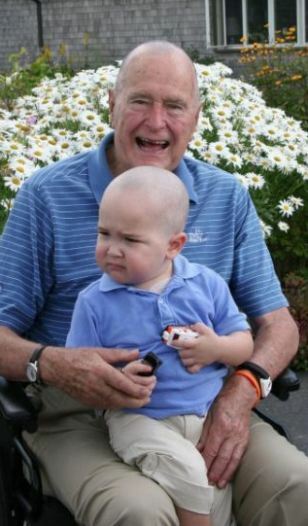 Bush shaved his head Wednesday to show support for his security detail’s 2-year-old son, who is sick with cancer. 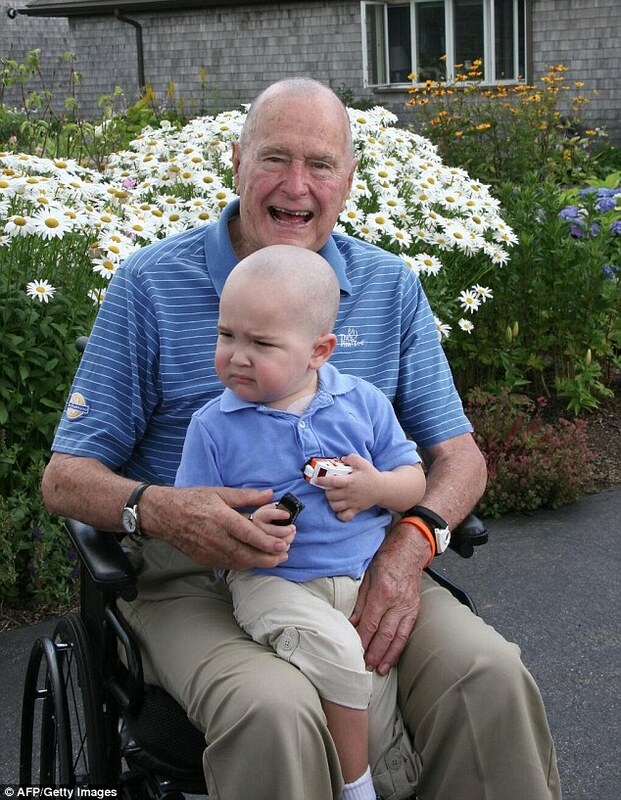 A heartwarming snap taken after the shave shows the 89-year-old former president grinning with his arms wrapped around 2-year-old Patrick, who is battling leukemia. Both Bush and the boy are wearing matching collared polo shirts in the photograph. Bush’s act of kindness comes nearly 60 years after he and his wife, Barbara Bush, lost their 4-year-old daughter Robin to leukemia. Robin, their second child after George W. Bush, died in October 1953. 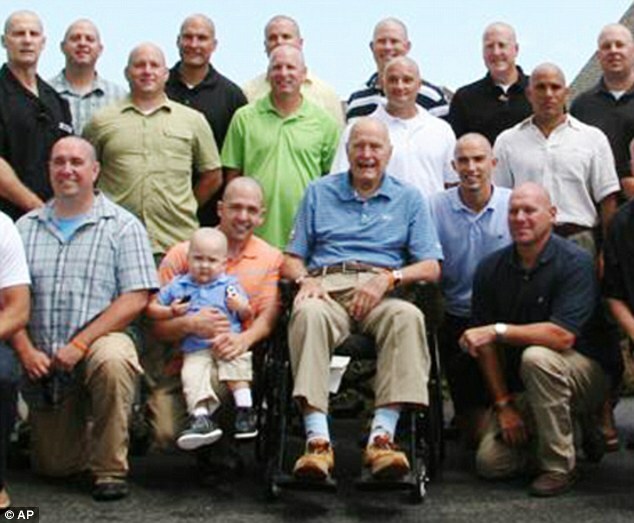 Every member of Bush’s Secret Service detail, including Patrick’s father, Jon, shaved their heads alongside Bush this week to show their support for the boy. The family is not releasing Patrick’s last name to protect their privacy. As the boy undergoes chemotherapy, Bush’s Protective Division has launched a website at www.patrickspals.org to assist with Patrick’s medical bills as he undergoes chemotherapy. According to the website, Patrick was diagnosed with leukemia several months ago. ‘While his prognosis is very positive, there will be many years of treatment ahead,’ the website says. 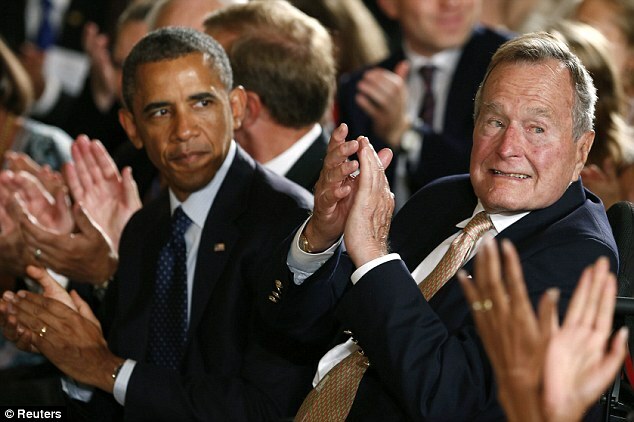 ‘We cannot thank both President AND Mrs. Bush enough for their generosity and concern!’ the site adds. The security detail has also organized an inaugural Patrick’s Pals Motorcycle Benefit Run on August 10 in Kennebunkport, Maine, where Patrick’s parents have a vacation home. The event involves a 50-mile motorcycle ride through the Maine countryside followed by a lunch and silent auction to raise funds for Patrick’s treatments. Bush’s decision to shave his head won wide praise on Twitter. ← DOORMAT FEMINIST BACKLASH: HUMA ABEDIN TAKING THE DOORMAT FEMINIST MEDAL FROM FORMER BOSS HILLARY CLINTON AND MAKING IT HERS, BUT WOMEN ARE NOT CHEERING THEIR SUPPORT FOR HER…LUCKY SYDNEY LEATHERS, RIGHT MONICA?